In 1943, adequate facilities were needed for test and evaluation of rockets being developed for the Navy by the California Institute of Technology (CalTech); at the same time, the Navy also needed a new proving ground for all aviation ordnance. The Naval Ordnance Test Station (NOTS) was established in response to those needs in November 1943, forming the foundations of NWC. The NOTS mission was defined in a letter by the Secretary of the Navy dated 8 November 1943: ". . . A station having for its primary function the research, development and testing of weapons, and having additional function of furnishing primary training in the use of such weapons." Harvey Field was commissioned at the auxiliary landing field at Inyokern, and the first facilities of the fledgling NOTS were established there while the building of the actual NOTS base at China Lake commenced. Testing began at China lake within less than a month of the Station's formal establishment, and by mid-1945 NOTS' aviation assets were transferred to the new Armitage Field at the China Lake site. The vast, sparsely populated desert around China Lake and Inyokern, with near-perfect flying weather year-round and practically unlimited visibility, proved an ideal location not only for T&E activities, but also for a complete R&D establishment. The early Navy-CalTech partnership established a pattern of cooperative interaction between civilian scientists and experienced military personnel that, in the ensuing five decades, has made NWC one of the preeminent RDT&E institutions in the world. Air-launched rockets, solid propellants, fire-control systems, and rocket and guided missile T&E were NOTS' primary areas of effort in the 1940s, and in the late 1940s, NOTS began research on fire-control systems that evolved into the concept of the Sidewinder guided missile. During World War II, the Station played a role in the Manhattan Project as the site of "Project Camel," which developed non-nuclear explosive bomb components--a role that continued into the 1950s. Holy Moses, Tiny Tim, and a family of spin-stabilized barrage rockets were fielded while the Station was built. After the War, the Pasadena Annex was added to NOTS, bringing with it the torpedo-development program and other underwater-ordnance RDT&E efforts. With the advent of the Korean conflict, NOTS rapidly gained cognizance over an even more extensive catalogue of rockets, missiles, and torpedoes and an array of guns, bombs, and fuzes. 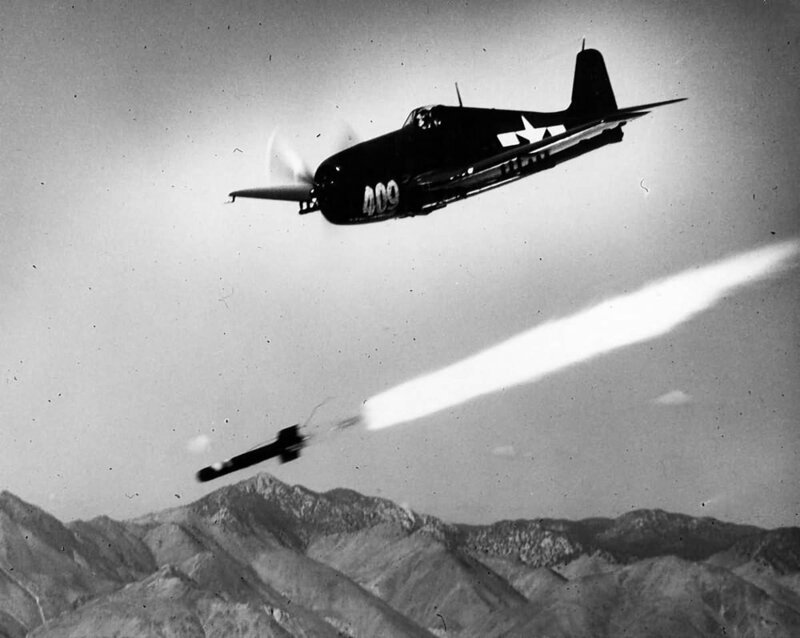 The Station sent the 6.5-inch tank-killing Ram rocket to the combat forces in Korea after only 28 days in development and testing, and the ensuing years saw the development and deployment of some of China Lake's most noted products, including the Weapon A, Mighty Mouse, and BOAR rockets; a series of torpedoes; new aircraft fire-control systems ("avionics" now); and, of course, the Sidewinder. By the late 1950s, research at China Lake had expanded into such diverse fields as weather modification and satellite-delivery systems. The Station also played a significant part in the development and testing of the Polaris missile system, including studies and analyses that shaped the Polaris concept. U.S. involvement in Southeast Asia in the 1960s quickened the tempo of activities at NOTS, and a new generation of "smart" bombs, cluster weapons, and night-attack systems was developed to meet Fleet needs. The Station had been preparing to meet conventional-warfare requirements, and the "Eye" series of free-fall weapons first saw action in Vietnam. Snakeye and Rockeye bombs, the Zuni rocket, the ASROC antisubmarine system, the Shrike antiradar missile, the TV-guided Walleye, and advanced Sidewinders were among the Station's products in the Fleet. NOTS developed and applied forward-looking infrared (FLIR) technology and systems, fuel-air explosive (FAE) devices, weather-modification systems, and space and undersea research vehicles during the decade; electronic warfare also received major attention, and the Station made significant contributions to countermeasures, special-warfare, and strategic-missile systems. In 1967 NOTS China Lake and the NOTS Pasadena Annex were separated; NOTS China Lake and the Naval Ordnance Laboratory, Corona, joined to form the Naval Weapons Center; in 1971 the Corona facilities were closed and their personnel and functions relocated to China Lake. With the Corona activity came guided missile and fuzing expertise and a history of accomplishment stretching back to World War II. Many of the NOTS Pasadena Annex underwater-ordnance systems, such as the Mk 46 torpedo and the CURV remote recovery vehicle, continued to be supported and improved by the San Diego-based undersea-systems activities that acquired the Annex' functions; NWC has worked closely with those activities over the years on a number of projects, ranging from Vertical-Launch ASROC to a personnel-management demonstration project. During the 1970s, the Center's direction changed along with the Navy's shift to more advanced, computer-intensive systems. Aircraft systems--avionics--became a major area of effort, as did advanced electronic-warfare systems and simulation efforts. Weapon System Support Activities (WSSAs) were developed for the AH-1, A-4, A-6, A-7, AV-8B, and F/A-18 combat aircraft, and NWC began fielding avionics software and hardware for everything from weapons integration to advanced self-protection techniques. The Center continued to develop advanced versions of the Sidewinder, Walleye, Shrike (including the original HARM program), and FAE weapons. Major support and improvement programs were also conducted for Sparrow, Phoenix, Harpoon, and Maverick missiles. China Lake research extended the technology base in optical and laser systems, advanced propulsion technologies, and antiradiation guidance. The Center acquired the National Parachute Test Range function in 1979, adding a new area of major concentration to the NWC mission; China Lake now serves as the Navy's parachute RDT&E facility. During the 1980s, NWC continued to expand its aircraft weapons integration and avionics activities and to further develop its simulation capabilities. New projects included the Advanced Common Intercept Missile Demonstration (ACIMD) program, which developed and demonstrated technologies for the next-generation air-to-air missile; the Sidearm and HARM Low-Cost Seeker antiradar-missile programs; the Skipper 2 laser-guided weapon; vertical-launch weapon programs, including Vertical-Launch ASROC; and advanced Sidewinder developments. China Lake's Sidewinder missiles were again combat-proven in the Middle East and in the Falklands. Parachute systems (including the Space Shuttle escape system) received major attention, as did the further development of full-scale aircraft targets, such as the QF-86 and QF-4. NWC also became a major contributor to the Tomahawk Cruise Missile program. The Center began the '90s with significant support to Operation Desert Storm. True to its heritage, NWC was ready with quick-reaction, on-demand efforts to support the operating forces; many of these efforts were conducted in concert with the operating forces and with other Navy activities. The Center conducted efforts that modified, improved, tested, and validated various aspects of Sidewinder, Tomahawk, FAE, HARM, and Shrike weapon systems to meet the immediate needs of the troops in the Gulf. NWC developed electronic-warfare system upgrades, developed and hand-delivered operational-flight-program upgrades, and developed and fielded new/improved weapon-integration and -targeting software for combat aircraft--including the F/A-18, AV-8B, A-6E, and F-14. Major flight-test support was provided for Navy and Air Force squadrons, especially using China Lake's Echo Range electronic warfare threat environment simulation, to help validate and update avionics and tactics. A variety of threat-analysis tasks, including weapon survivability and vulnerability analyses, were also conducted and supported by the Center to help ensure maximum effect with minimum attrition, and NWC supported efforts to protect Allied forces against the potential use of chemical weapons by Iraq. Numerous small quick-reaction projects, too, were conducted in support of various aspects of the combat operations; many of these projects were aimed at improved aircrew safety. The ability of the Center's military-civilian team to meet these challenges depended to a large extent upon the China Lake combination of research and development laboratories and test and evaluation ranges and facilities. This unique, highly capable combination of in-house technical talent backed up by operational expertise with available facilities for all aspects of RDT&E has supported the Fleet for 50 years and significantly increased the Navy's tactical flexibility. On 22 January 1992 NWC was disestablished. The RDT&E functions of NWC were combined with the T&E functions of three other Navy activities to form the Naval Air Warfare Center Weapons Division; the NWC facilities, military administration, and airfield functions were consolidated into the Naval Air Weapons Station China Lake. Today China Lake carries out the complete weapon-development process--from basic and applied research through prototype hardware fabrication, test and evaluation, documentation, and Fleet and production support. China Lake is home to approximately 4,400 civilian employees and about 1,000 military personnel (including tenant Operation Test and Evaluation Force squadron VX-9) and is supported by over 1,500 contractor employees. Major China Lake programs include RDT&E and support for Sidewinder, Sparrow, and Phoenix air-to-air missiles; fuzes for the Standard Missile and a wide variety of other surface-to-air and air-to-air missiles and free-fall weapons; Harpoon antisurface weapon system; Tomahawk cruise missile; Sidearm and HARM antiradiation-missile programs; parachute systems and subsystems for aircrews and equipment; avionics hardware and software and total-combat-system operational flight programs (OFPs) for most Navy fighter and attack aircraft; and tactical electronic-warfare and countermeasures systems. China Lake analysis and T&E capabilities and projects remain unmatched, with simulation of threat weapon systems; major electronic-warfare threat-simulation facilities; and complete test and evaluation--static, live-fire, captive-carry, supersonic-track, environmental, radar cross-section--of a wide range of antiair and antisurface systems. Contributing to and complementing these projects are broad technology-base efforts, which range from basic research in physics and chemistry to applied projects in energetic materials, embedded computers, specialized semiconductor and superconductor materials, and lasers and optics. The in-house laboratories of the Navy are unique institutions, and China Lake unique among that cadre. China Lake brought to the Navy the advanced technologies, the engineering disciplines, and the integrated laboratory-operational perspective that resulted in the Navy-industry team that proved so phenomenally successful during the years of China Lake's growth and maturity. Not to say that the China Lake team made no mistakes along the way. It did. The Station--the Center--learned some hard lessons over the course of its evolution. It won many battles, but it lost many, too. In the long run, the China Lake experience proves that, "When given a certain amount of freedom within an atmosphere of technical expertise, available facilities for basic RDT&E, and close operating relationships with the military community, the individual and corporate creativity characteristic of the laboratory community can arise to resolve operational problems and meet military needs and to lay the groundwork for further developments." This, perhaps, is China Lake's legacy: foundations well laid for the future. . . As to how those foundations are built upon, the next 50 years will tell.